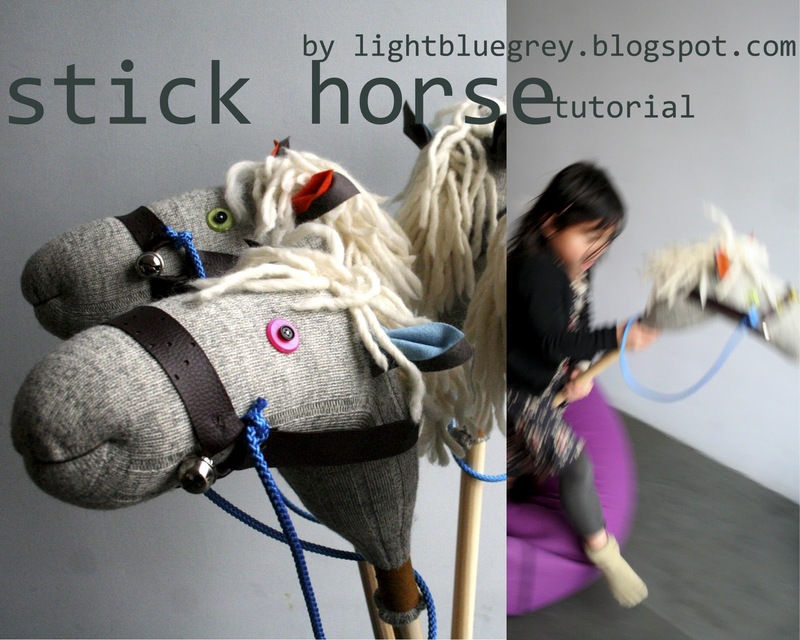 On special request I made you a stick horse tutorial. If you like to read more about these horses, just go here, here and here. Get started. Cut the broomstick, not on the rounded side, to the desired length. Make a ridge on a distance of 30 cm from the cutted top. Fill the sock with stuffing. 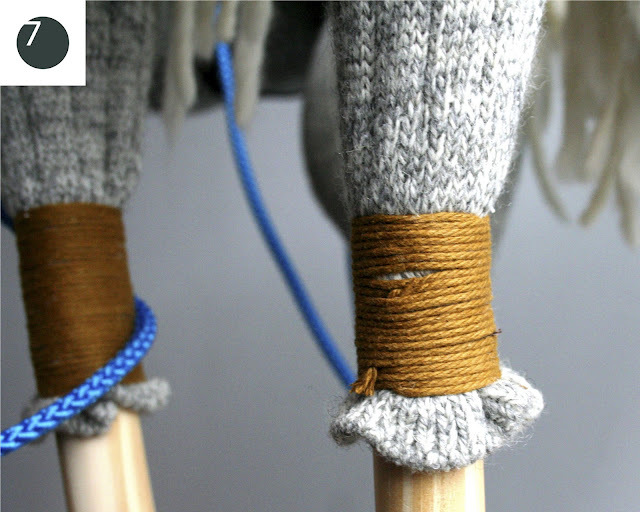 Attach the manes, starting from the heel of the sock, down to the opening for about 15 cm. Tie up with double knots. Be sure to attach the manes in a row close to each other. Attach the eyes, take care to attach them symmetrically. Take a long and strong white doubled thread, make a knot and start on the spot of eye 1. 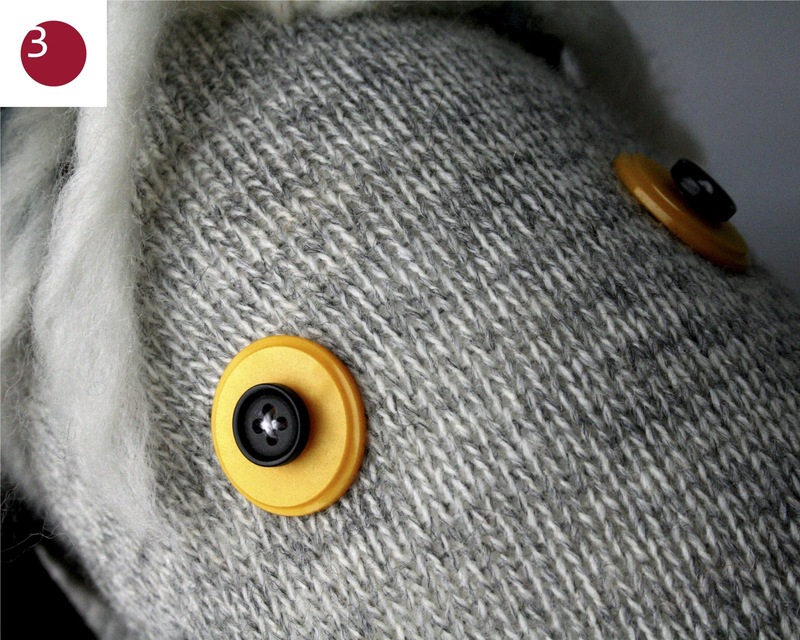 Go with the long needle to the other side, attach with a normal needle a colored button and a small button on top (eye 2) and go backwards to the knot. Attach eye 1 the same way and go back. Attach eye 2 for a second time and go back. Attach eye 1 for a second time, finishing with a knot under the button. Cut. Make the mouth. Take a long and strong dark doubled thread. Go with your long needle right through the sock, go again in the same direction through the sock on the same spot, then again for a third time. Pull for shaping a mouth and make a secure knot. When finished just rotate the thread in order to vanish the knot from sight. The knot is now into the sock. Pull the mouth a bit down to get a better result. Cut quarter circles of felt, taking two colors and two different diameters, in my case 18 and 14 cm. 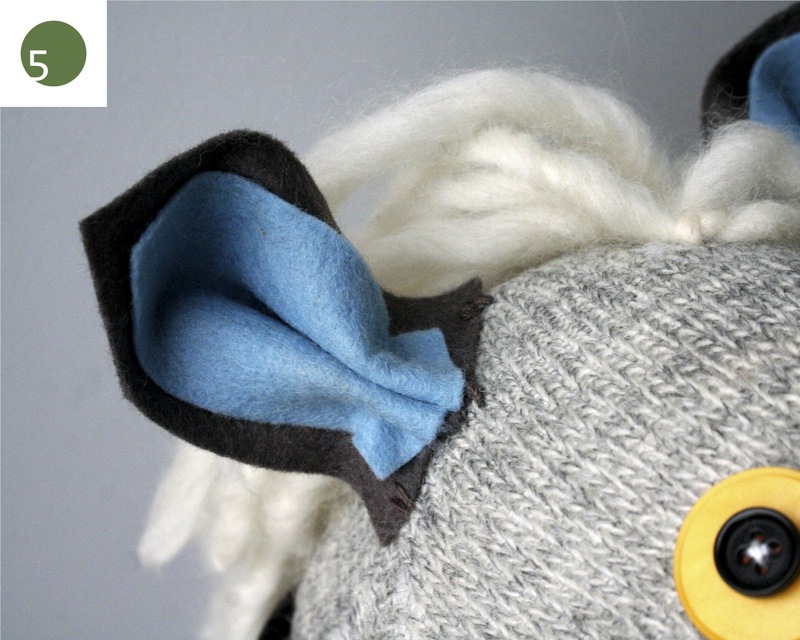 Fold and stitch across to shape an ear. 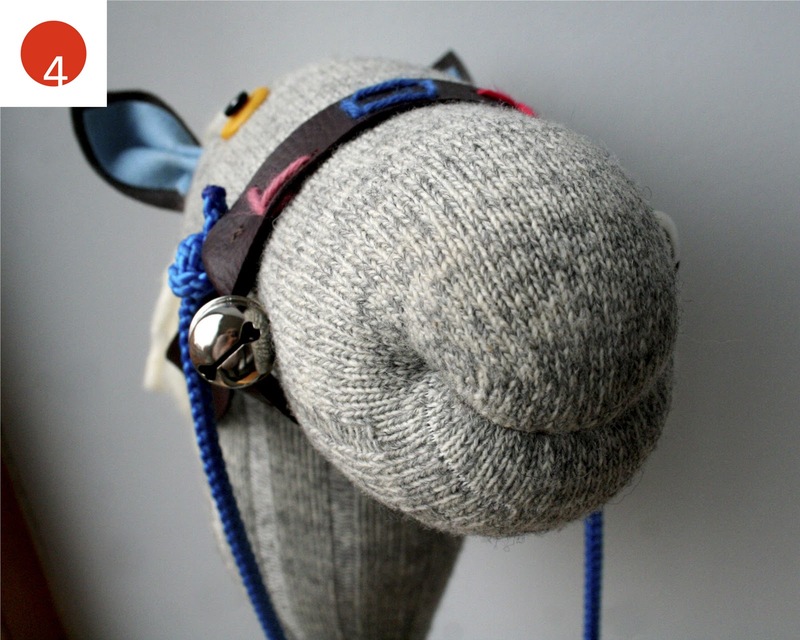 Attach the ears to the sock, be sure to do this symmetrically. Cut with a metal ruler a leather strip of 2,5 cm wide, 1 meter long. Hold the key rings on both sides of the head and measure the length needed for the top strip, which is about as long as the under strip. Cut top and under strip 5 cm longer than measured. If you like to, you can punch holes in the top strip to embroider a name afterwards. Attach bells to the key rings. Attach top and under strip to the key rings, by sewing a cross with the strong dark doubled thread. Put it on. Measure from one key ring, down to the lower side of the manes, back to the other key ring. Cut a third strip 5 cm longer than measured (in my case 50 cm). Attach this strip the same way to the key rings and under the lower side of the manes. The manes will hang over this attachment. Attach rein to the bridle. Put the stick into the sock, right up to the sock’s heel. If needed add more stuffing. Go with a needle and a strong dark doubled thread about 2 cm from the opening of the sock. Turn around the stick a few times, securing the thread through the ridge. 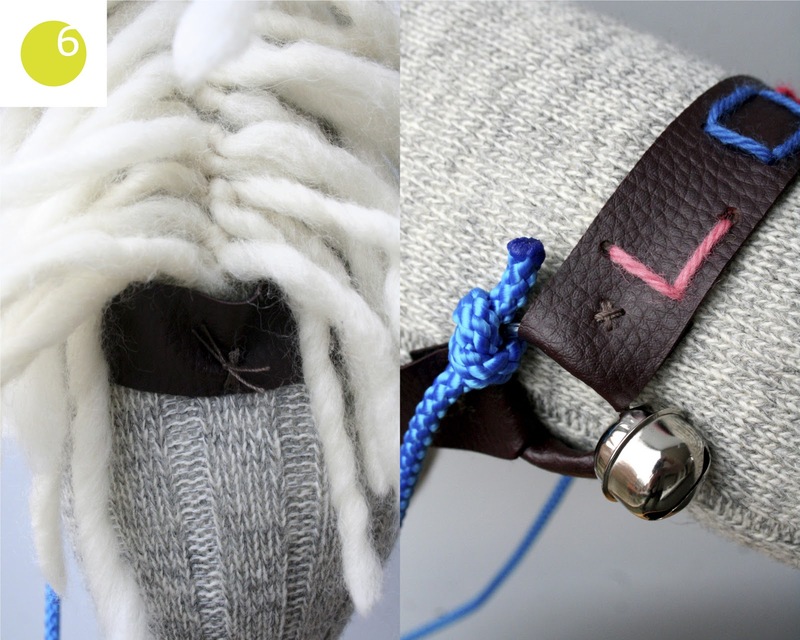 Go back to the outside of the sock again, turn around the sock a few times and tie securely. Tie now (on top of the dark thread) with the cotton rope like in the picture, starting by turning around over the beginning of the rope as tight as possible and ending by pulling the rope with the long needle under all strings. Cut. This tutorial is for personal use only and may not to be used commercially. Great tutorial writing skills. En sinds kort weet ik dat dat nog niet zo makkelijk is. Zeker niet in het Engels. wow! a really funny tutorial, thank you! Hetty, waar heb je dat mooie okerkleurige touw gevonden? I love this--thank you so much! These are such a good idea. Beautiful, thank you. Aww, he's BEAUTIFUL! Meisje emailed me about him and I'm so glad she did. She was right, I love him! I would also love to link to your tutorial if you didn't mind. You can't beat homemade toys! I will SOO be making one of these for a friend, thanks so much! What a wonderful toy! It's adorable! I love, love, love this! Thanks for the tutorial - I can't wait to make a few of these. This is so brilliant, thanks for the tutorial and the links to others. I'll definitely be making one, though my husband declares he has no spare socks so I'll have to go out and get some! These hobby horses are so lovely - I found them via the Meet Me at Mikes link. I have already bought a variety of things to make some horses for my daughters. I was going to make it up as I went along, but now I don't have to. Thank you! I love the look of your blog too. Beautiful photos, projects and ideas. Very inspiring!! Super cute! I wish I had a little one that I could make one for! Thanks for sharing ... I'll be linking. Wauw, geweldig! Deze ga ik zeker eens uitproberen! So beautiful. I think I will try to make one. too cute. Yours is adorable...! Thanks for sharing your mad skills! I featured this on my blog, I can't wait to make some for my boys! u r so talented thank u. Thanks for the idea! See at www.ikhebeenbep.web-log.nl ! I linked your tutorial in my blogpost. Great lovely horses! Thank you for the tutorial! I keep coming back to look at these. They are SO, so adorable. This project is on my "must do" list! Could i translate this pattern in French for my lectors ? It's like a dream for me... playing with John Wayne on my horse !!! Yeeaaaaaah ! Now i'm too old for that but ^-^ perhaps ! Really great horses! Making some for my nieces now, just can't resist.. Any tips for attaching the manes? The socks I'm using are pretty tightly knit, making them a bit of a struggle. Many thanks for sharing your ideas! WoW!!! I totally love them!!! I just was getting ready to make one for my elder daughter! Yours are so authentic:) Thank you for sharing and making my life easier!! Just genius! I love it! I have just decided to make one for a dear friend's little girl for Christmas. Thanks for the instructions! i'm so excited to see this! thank you for your hard work in putting the tute together. I will be making these for my girl, they'll love them! These are just adorable. Thank You! Si me lo permites, lo publicaré en mi blog, para que todos mis seguidores puedan comprobar tu creatividad. hello from chicago! 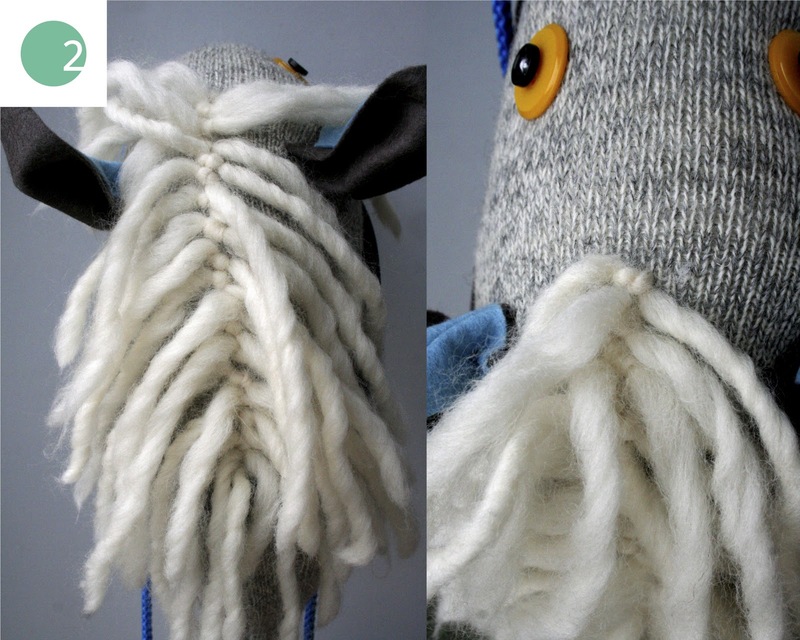 I made a bundle of these guys (well, something akin to these guys) for my son's bday party. they were a huge hit! thank you, thank you for your daily inspiration! 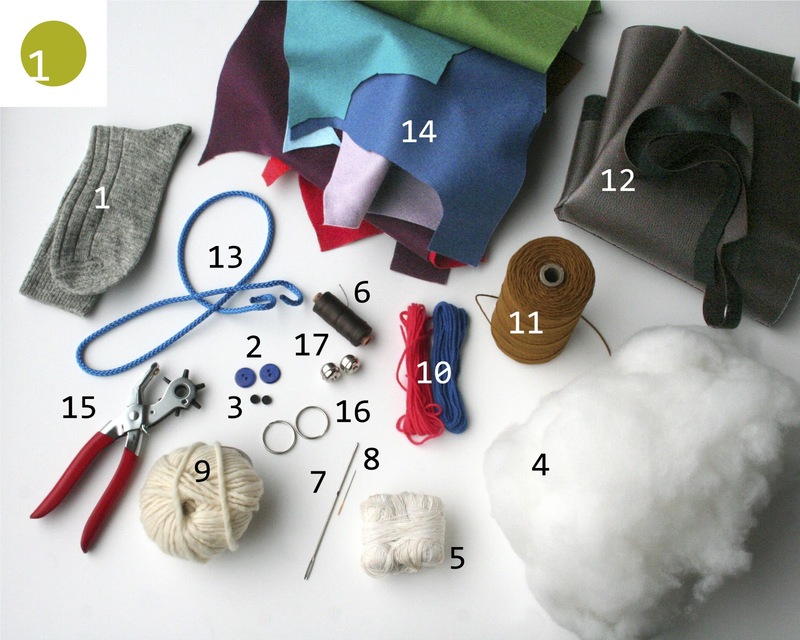 I love following your blog and find your projects so inspiring. I would particularly like to thank you for your inspiring horse tutorial. My son had a cowboy birthday last year, so I followed your advice and made horses as presents for the children to take home. They were a huge hit and it was great to see the kids turning up at the park the following day on their horses. Hello! I tried posting a comment ages ago, but it seems it never showed up here! I was so enamored by your post, I made these for my goddaughter and her sister. Thank you for your BEAUTIFUL blog and for being an inspiration! Nothing is more fun then being a child and pretending your riding a horse. A few months ago, out of the blue my little grand daughter said I would like to have a "horse with button eyes". I thought to myself well maybe I can make on with felt on a tshirt for her...until I saw this one....thank you. Great tutorial ! 10x ! Looks great!! I'll try to make one for my sons! thanks for the tutorial! This is brilliant! We have one horse and my kids always want more! I could even make one a unicorn! Thanks for sharing your wonderful tutorial! I'm pinning this to my Gifts for Preschoolers (DIY Style!) board!